Apparently there is too much turmoil in the upper ranks of Samsung to get an opinion from there on the iPhone X, so sometimes you have to turn to the next best option. Who is Jesus Diaz, you wonder? Jesus Diaz founded the new Sploid for Gawker Media after seven years working at Gizmodo, where he helmed the lost-in-a-bar iPhone 4 story. The iPhone X is a sham. The epitome of fluff over function. OK! OK. OK. Stop. Just… that’s fine. We get it. [Kisses fingers like a French chef] Mmmmmmwah! You have done it again, sir. You may think I’m being unfair. Well, more petulant than unfair. There’s a difference. Diaz hates the notch, ‘natch. But putting all of that aside, do you really need a 5.8-inch OLED display? It’s amazing how all these “do we really ‘need’ these features manufacturers keep putting into our smartphones?” pieces only come out when Apple introduces something. Maybe the horny one missed all the hand-wringing about the screen size of “phablets” contributing to our collective moral turpitude because it was lost in the flood of “APPLE DOOMED FOR NOT RELEASING PHONES WITH LARGER SCREENS!” pieces. Surprise! Diaz also doesn’t think much of Face ID. FaceID doesn’t solve any problem that wasn’t solved before by TouchID. Face ID is so fast it makes Touch ID suddenly seem slow and onerous by comparison. After a weekend with the iPhone X… Face ID is a game changer on more levels than I expected. Suffice it to say, people who’ve actually used it and don’t have a long-standing grudge against Apple tend to disagree. There really isn’t much in the iPhone X other than the camera that Diaz thinks is worth anything, not even the faster processor. Do we need processors that handle machine learning–the capacity of a computer to recognize the reality around you and make intelligent decisions–faster than a regular processor? Why even improve things?! Weren’t we all happier when we carried eight-pound mobile phones with foot-long antennas and had hair that went all the way down and were grunging out to all those great Soundgarden songs by Stone Temple Pilots? Frankly, the Macalope thinks he was happiest when he was pulling around one of these. The truth is that none of the iPhone X’s features really justify the “it comes from the future” mantra that Apple and its acolytes are chanting. It doesn’t come from the future. Of course it doesn’t. There is no time altering or bending going on here. But, Apple did bring us features earlier than they probably would have if they just continued their normal update routine, which is one of the reasons you can’t get an iPhone X right now, because they aren’t able to ship them in quantity. 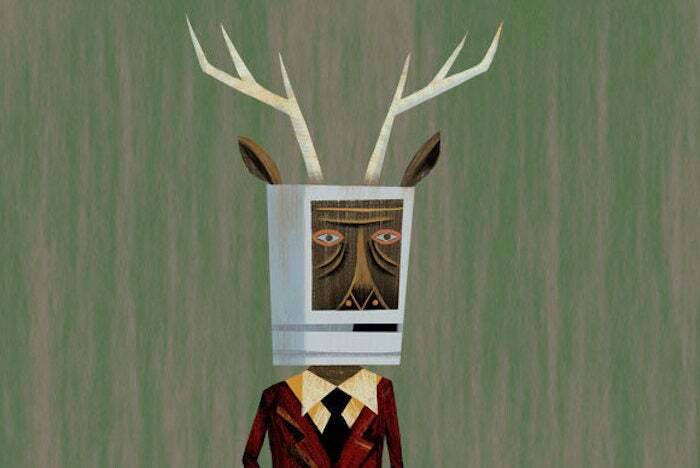 Hey, even the Macalope has slowed his iPhone roll since he’s still using the iPhone SE he bought a year and a half ago. No one has to buy an iPhone 8 or X. But, by most accounts, it’s a really nice phone with a number of cool new features and will give Apple a very good release cycle this year. Do you “need” an iPhone X? No, probably not. But we buy a lot of things we don’t “need”. People only pontificate about it when it’s stuff from Apple.